A very common misconception when caring for a parrot is to feed too much dry seed. A parrot kept on dry seed alone can end up with multiple problems, such as poor feather quality, obesity, fatty lump formation, fatty liver, diabetes, fractures and respiratory disease. The U-Vet Werribee Veterinary Hospital is research-intensive and we are dedicated to the advancement of animal, human and environmental well-being through the education and development of world-class veterinary scientists. Some suitable brands include Vetafarm (maintenance or nutriblend). Tropican, Harrisons, Roudybush. There are many available in a range of each of these brands so be sure to get the one most suited to your species. Seeds, breads, toast, dried fruits and nuts, and plain crackers should be reserved for use as treats and only given in very small portions. They are particularly useful as an incentive for training. Unfortunately, for most birds, we cannot simply change the food we place in their cage and expect them to eat it. Rather, we have to teach them these new foods are actually food. With time, decrease the amount of seed in the mix, then decrease the amount of water until only dry pellets remain in the bowl. This can take anywhere from 1 week to several months so please be patient and persistent. You can try pretending to eat the pellets yourself if the bird likes to share your food. An insurance feed of dry seed for 15mins a night in a separate bowl is recommended until the bird is definitely eating pellets. 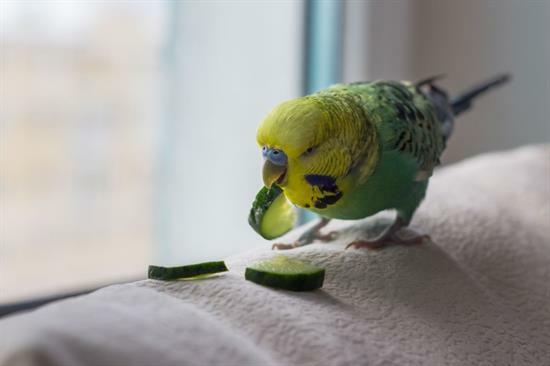 We also often have to teach our parrots that vegetables (and fruits) are food. A good way to start is by rolling the vegetable in seed or push seeds into the flesh of the vegetable so they taste the vegetable as they grab the seed. Just because they don't eat a vegetable the first few times it is put in the cage, it doesn't mean they won't ever - you need to persevere!